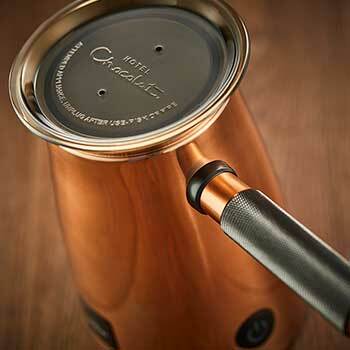 How is using this hot chocolate machine different to making instant hot chocolate? Instant hot chocolate is mostly sugar (or chemical-laden sugar substitutes) with very little cocoa powder; we’re all familiar with the lumpy, artificial-tasting results. The Velvetiser uses only pure grated chocolate with a deep, not-too-sweet flavour profile. The texture of your finished drink is paramount; not too thick and not watery thin, but luxuriously silky-smooth – ‘velvetised’. Once you’ve velvetised, there’s no going back. How do you make a hot chocolate with a machine like this? Effortlessly. First, make sure your whisk is in place, this is really important. Then add your choice of liquid and pour the real chocolate on top. Close the lid, press the button and the perfect hot chocolate will be ready in just 2.5 minutes. Just remember these 3 easy steps; whisk in place first, liquid and then chocolate. This will give you the best result and ensure you don’t damage your whisk. What sorts of liquid can I use? Plant milk – almond, cashew, coconut, hazelnut, rice, soya Water – 100% water or 50/50 water/milk mixture, depending on personal flavour preferences. Experiment away! 2.5 minutes – to thoroughly melt the real chocolate and to whisk/beat into your choice of liquid. Can I grate my own chocolate into The Velvetiser? No. It’s calibrated to work with our graded size and weight of real chocolate flakes – precisely measured for the best taste and texture. Excessively large pieces of chocolate can break your hot chocolate machine by creating ‘hot spots’ that can burn out the motor. Where do I get the Hot Chocolate from? Direct from us at Hotel Chocolat. Innovative new hot chocolate recipes are being launched all the time, including limited edition and seasonal specials. Can I use other cup sizes? We’ve balanced the amount of liquid to chocolat to create the perfect taste and texture. Use 220ml (8oz) of liquid for every single-serve dose; in our experience this is the perfect serving size, leaving you satisfied but not overly full. Half Cup? Use half the liquid and half the single-serve pouch.Full instructions on every pack. Can I make cold chocolat with the Velvetiser? Yes. Use a full single-serve of chocolate flakes but with only half the liquid. Then pour the melted, whisked chocolat over 6–8 ice cubes in a glass and top up with the other half of the chilled liquid. Can I make coffee with the Velvetiser? No, but you can make a mocha: just add a shot of coffee to your velvetised hot chocolate for the perfect mid-afternoon pick-me-up. Can I use my Velvetiser to create frothy milk for my coffee? Yes, it will do it fairly well even though that’s not what it was designed for – which is to whisk and beat melting chocolate. Filling your cup completely full of boiled water and then emptying just before pouring your hot chocolate is a technique to serve at the hottest end of what we recommend. The Velvetiser has been calibrated to serve at the best temperature for flavour, which is up to 68-70 degrees. However a few degrees either way is also perfectly acceptable, and remember that warming your cup beforehand is a perfect tip if your preference is for a slightly warmer drink. If hot chocolate is much hotter than this, the delicate flavours are scalded so we’ve worked hard to ensure this never happens – it’s often why your hot chocolate doesn’t taste as good as you’d expect at some coffee shops. How do I use this hot chocolate machine – plug it in or put it on the stove? It’s electric – the Velvetiser comes with a standard 13A UK plug ready to go. How do I clean it – is it dishwasher safe? Cleaning is very easy. The Velvetiser itself is not dishwasher safe, but has an easy-access, wipe-clean, non-stick chamber for which we recommend a soft cloth with a bit of soapy liquid, then rinse. The whisk can be removed easily and either rinsed under the tap or dishwashed. Trust us, you won’t want to. We do ask that you call or email us first though on 03444 932323 or help@hotelchocolat.com as there may be something we can help with, and also to let us know that your Velvetiser is coming back. Other than that it’s as simple as handing it into store or sending to FREEPOST Hotel Chocolat with your proof of purchase. Always ask for Proof of Postage to be on the safe side! Please email or call us at 03444 932323 or help@hotelchocolat.com as there may be something we can help you with. If necessary, we will then send you a return label and form to use. You can also return your Velvetiser to a Hotel Chocolat store. Depending on why you are returning your Velvetiser, we’ll either send you a replacement or issue you with a refund or a Gift Card. You may notice some dark smudges collecting on the base of your whisk – they’re from the ingredients placed within your Velvetiser so don’t worry, nothing’s wrong! 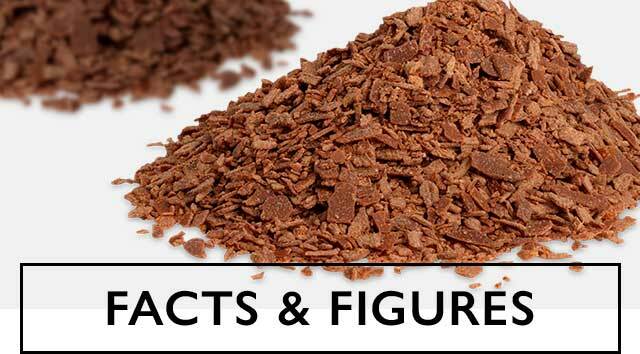 The smudges are a blend of the naturally and commonly occurring content of your chocolat flakes as well as proteins, fats and sugars from your milk choice that bond and accumulate on the whisk base and are harmless. Remove your whisk and run through your usual dishwasher cycle. Remove the whisk and wash thoroughly in your sink/washing up bowl in hot, clean water with washing up liquid added and rinse thoroughly before placing back inside your Velvetiser. My Velvetiser won’t switch on / switches off after a few seconds. Your Velvetiser wants to make you the best cup of hot chocolat but needs you to follow the instructions in the correct order to ensure this happens. Firstly, always follow the 1-2-3 of whisk – liquid/milk and finally chocolate. Working in this order is really important to prevent any damage to your whisk and to ensure the chocolate melts and mixes correctly to give you that perfect velvety finish. If for example you add your chocolate first, you may experience a problem starting your Velvetiser. If you find your Velvetiser still won’t switch on, we would recommend rinsing the Velvetiser with cool water to reset the thermostat. 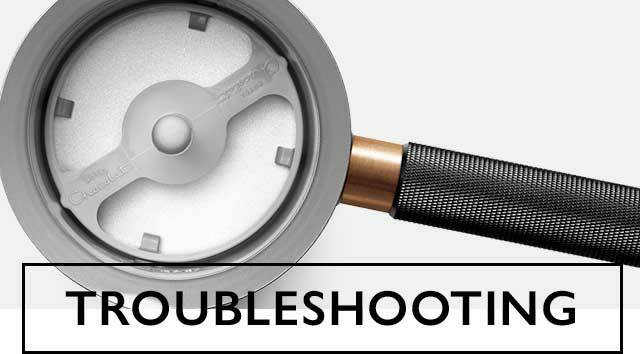 This ensures it starts every process at the correct temperature and if you have already made several cups, the thermostat may just need to reset again, and any issues with your power button can be a simple prompt to do so. 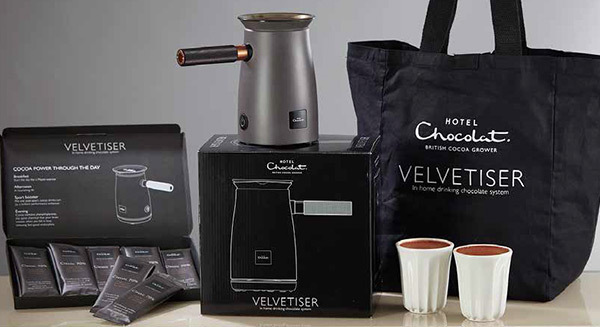 We have even made a quick video to help you and suggest watching this first https://www.hotelchocolat.com/uk/about-the-velvetiser.html If your Velvetiser is still not working, then please do get in touch so that we can help. How much sugar in each serving? It varies from 0% to just 6% sugar per cup, depending on the recipe. ‘More Cocoa, Less Sugar’ has always been our mantra at Hotel Chocolat. Cocoa is the first ingredient in all our chocolate recipes for a deeper, more satisfying taste. Because we use less sugar, we can use more cocoa; cocoa is full of good (not empty) calories, making it a healthier fuel for your body. Check the overall calories in your serving below. Does hot chocolat have caffeine? Only in small amounts. Three cups of hot chocolat have less caffeine than 1 mug of tea*! 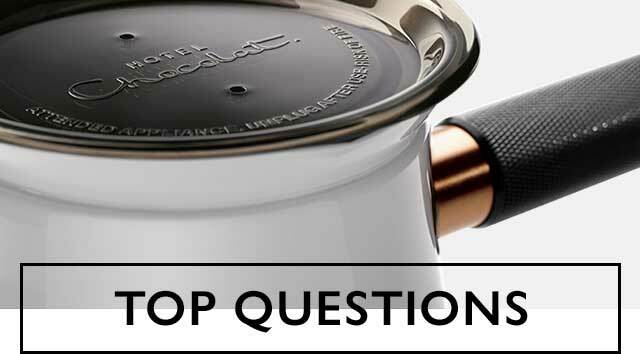 Can I use a standard milk frother machine with your single-serve hot chocolate? Although milk frothers are designed to froth rather than whisk/beat, they will work to a degree. However, the Velvetiser it is dedicated to making the perfect hot chocolate, so it will always deliver the best result. How big is the Velvetiser? 23 x 22.5 x 12cm – a little taller than the average kettle. Can I send the Velvetiser overseas? It’s designed and tested for UK voltage only at the moment – but international versions are being developed for next year. What are the wattage and voltage? Your full parts and labour guarantee lasts for 1 year from purchase.